If you’re visiting New York City for concrete canyons and neon lights, Manhattan is the place to be. But if you want the hippest shops and restaurants and the feel of a real neighborhood, get thee across the river to Brooklyn. These days, Brooklyn is where it’s at. Unfortunately, Brooklyn hotels haven’t kept pace with the area’s appeal. You’ve got downtown chains that can go for $300 a night or one-star spots with one-star appeal. And then there’s the Akwaaba Mansion Bed and Breakfast. Set in an 1860s Italianate mansion on a quiet tree-lined street in Bed-Stuy (yes, Bed-Stuy has them! 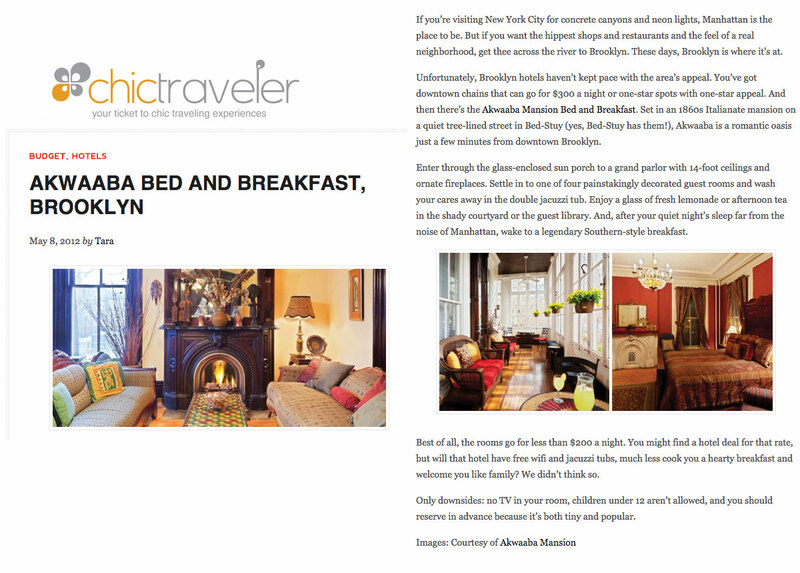 ), Akwaaba is a romantic oasis just a few minutes from downtown Brooklyn. Enter through the glass-enclosed sun porch to a grand parlor with 14-foot ceilings and ornate fireplaces. Settle in to one of four painstakingly decorated guest rooms and wash your cares away in the double jacuzzi tub. Enjoy a glass of fresh lemonade or afternoon tea in the shady courtyard or the guest library. And, after your quiet night’s sleep far from the noise of Manhattan, wake to a legendary Southern-style breakfast. Best of all, the rooms go for less than $200 a night. You might find a hotel deal for that rate, but will that hotel have free wifi and jacuzzi tubs, much less cook you a hearty breakfast and welcome you like family? We didn’t think so. Only downsides: no TV in your room, children under 12 aren’t allowed, and you should reserve in advance because it’s both tiny and popular.